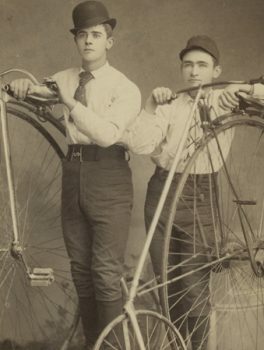 Greeley men with high wheel bicycles. During the 1870s the “high wheeled bicycle” was invented. It was also known as the “penny farthing” or the “ordinary”. While it had two-wheeled predecessors, the high wheel was the first all metal contraption to be dubbed a bicycle. Bicycles in the 1870s were rare in Greeley; they were very expensive and would have cost the average citizen six months salary. However, by June of 1882 the city’s first bicycle club, aptly named the Greeley Bicycle Club, was formed, and there were twelve bicycles and their riders as members. Bicycling was touted as healthful, and it gave the opportunity for entertainment. By the 1890s the design of the bicycle was altered to counter the dangers of the high wheel. The new machine, called the “safety bicycle”, quickly replaced the high wheel. These bicycles had two equal sized wheels driven by a metal chain. This new design opened the world of bicycling to larger portions of the population. In addition, the materials and methods of manufacture improved, which made the bicycle more affordable. With improved safety, bicycles were now being used as a mode as transportation as well as entertainment. W.C. Thomas, who was the superintendent of schools, visited schools throughout the county on his bicycle. Women were also now included in the bicycle revolution. At first, their modesty and restrictive dress prevented riding the high wheels, but the safety bicycle was much easier to mount and clothing was altered to a more “rational dress”. Dr. Ella Meade, Greeley’s first female doctor, traveled on her bicycle to make house calls until 1906. Greeley had two bicycle clubs by the 1890s; the Colonial Wheel Club for men, and the Atlanta Cycling club for women. The men’s club in Greeley was the first in the state of Colorado to be ordained under the League of American Wheelman; a national group advocating for bicyclists’ rights and improvements. The group lobbied for local governments to improve roads and enact laws to make bicycling easier, more accessible, and safer for everyone. The League of American Wheelman still exists today as the League of American Bicyclists who originated June as National Bike Month in 1956.